In this experiment, the second in a continuing series of tele-operated lethal experiments, anonymous participants will establish a direct link using publicly available software over the internet into the control circuitry of one of the most dangerous devices at Survival Research Laboratories (SRL) -- the Air Launcher. The Air Launcher consists of a high pressure gas launcher capable of targeting and delivering an explosive round within a one mile range. 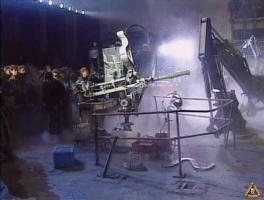 For this experiment, the Air Launcher will be limited to firing within a target range containing an assortment of technological artifacts and a few surprises. This system is also equipted with a video and audio feed to the internet. Remote participants will interface directly to the Air Launcher located at Survival Research Laboratories headquarters in San Francisco where they will be capable of remotely targeting objects, sequencing the loading of the projectiles into the air launcher barrel, and ultimately launching the resulting ordnance, obliterating the intended target. All operations will be controlled remotely without any local human intervention. You can view the control applet now. * Mark Pauline will be in Chicago, IL (USA) and will be firing the first explosive projectile. Connection in Chicago provided by theLAB. * Live video is active now until the event. You can view the feed by downloading CU-SeeMe from the Cornell University site. Connect to the reflector at cuseeme.zkm.de. If the video is down please check back as we may be tweaking the hardware. Stay tuned as our next event with feature newer video compression technology. * The event is NOT public due to space constraints. We hope to have a public event soon. Please check this site for the most recent and up to date information about this experiment.